F.O.A.M.er Karl Bolter sent this "in the wild" pic of the Batman Unlimited line of 12" action figures on sale at Walmart. 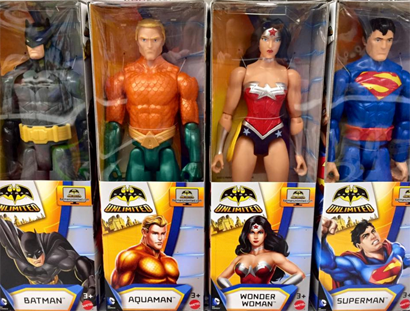 When it comes to merchandising, I love seeing Aquaman included so regularly with the trinity now! ...and then here's the figure by himself, brought home by F.O.A.M.er Curtis Smith! 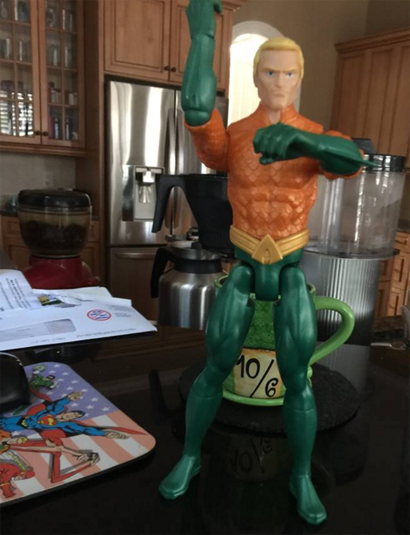 Aquaman, ready for action! * Thanks guys! Nice to see these figures. Even though, DC has about 5% of the presence on toy department shelves that Marvel has. Is he doing "The Aristocrats?"